This post will be my initiation into the world of blogging!!! You may or may not have seen my cards on Splitcoast (SCS name Linda L Bien), but my daughters (susiestampalot and Sara Williams (TweaksandDesigns.com) have convinced me what fun it is. My other daughter, Nancy, will be joining the blogging ranks soon, so I thought .... "the family who blogs together, stays together"!! Besides that my granddaughters are also getting into it. Grandma needs to be in the 21st century!!! This Halloween / Fall / Thanksgiving / Christmas season is my favorite time of the year, so it makes it even more inviting to start NOW!! I'm posting some cards that were some of my most recent ones. 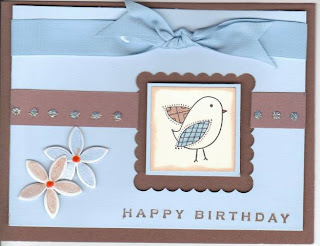 This little card is one of my favorite images using Hero Arts Decorative Birds set of four little birds. The paper is SU's Chocolate Chip. Close to Cocoa, and Bashful Blue. The white is from Georgia Pacific (WallMart) that seems to work well with all that I have used it for on my cards. The image is stamped with Stazon Black and coloring with SU markers. I used Stickles crystal blue for the dots across the middle. These cute little flowers is a container of table confetti from Michaels wedding department and I colored them also with markers and then made the centers from fabric applique. Thank you for visiting my blog and I hope to get better and better as I go along. Sara (Tweaks and Designs) has me in her que to design a MUCH MORE attractive and versatile blog page. I love this card and Lily said, "OH...that bird is cute. Her wings look like leaves only they are wings, cool!"